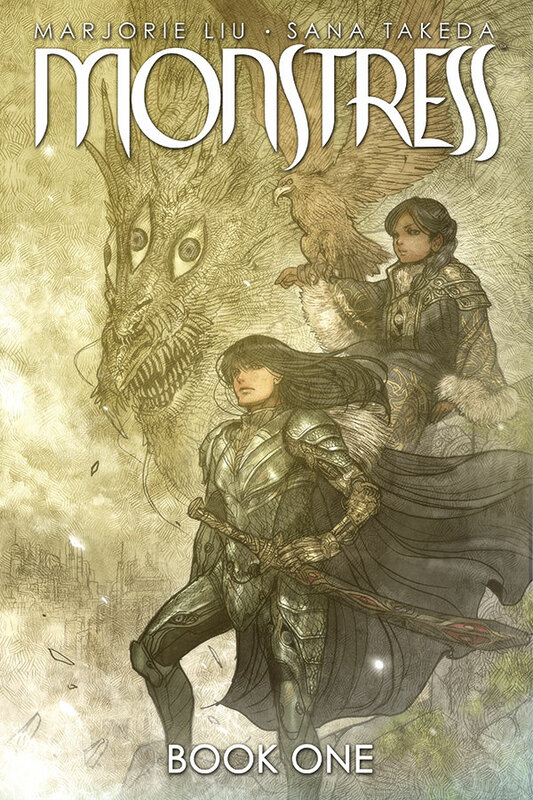 PORTLAND, OR 12/12/2018 — Image Comics is pleased to announce that the multiple Eisner Award- winning series Monstress by creator/writer Marjorie Liu (who made history as the first woman to win an Eisner in the Best Writer category for the series this year) and creator/artist Sana Takeda will be collected into a deluxe, oversized hardcover edition, Monstress: Book One, in July. A new story arc filled with adventure will launch this January with Monstress #19. 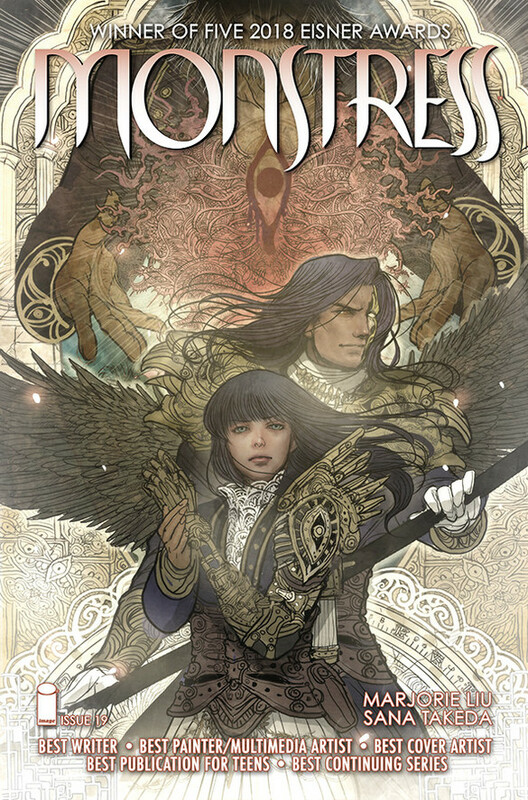 The Monstress: Book One hardcover edition will collect the first 18 issues of the New York Timesbestselling, Harvey Award, two-time Hugo Award, two-time British Fantasy Award, and five-time Eisner Award-winning series, and feature a striking new cover, as well as special extras, including never-before-seen sketches, script pages, and more with over 500 pages of award-winning content. While fans wait for the hardcover edition this summer, they can pick up Monstress #19 in January, which will begin a new story arc in the series and will follow Maika and Corvin on their search for Kippa through a warped and lethal land, where even Kippa herself will face her own terrible monsters. The richly imagined world of Monstress is an alternate matriarchal 1900s Asia, with an art deco-infused steampunk aesthetic that’s brimming with arcane dangers. Within it, a teenage girl struggles to overcome the trauma of war, a task that’s made all the more difficult by her mysterious psychic link to an eldritch monster of tremendous power—a connection that will transform them both and place them in the crosshairs of both human and otherworldly powers. Monstress #19 (Diamond Code NOV180165) will be available on Wednesday, January 23rd. The final order cutoff deadline for comics retailers is Monday, December 17th. Monstress #19 will also be available for purchase across many digital platforms, including the official Image Comics iOS app, Amazon Kindle, Apple Books, comiXology, and Google Play. Monstress Book One hardcover (ISBN: 978-1-5343-1232-6) will be available in comic shops on Wednesday, July 3rd and in bookstores on Tuesday, July 9th. It can be pre-ordered on Amazon, Barnes & Noble, Books-a-Million, IndieBound, and Indigo.